I heard about Magicjack that is a kind of VoIP service before I saw its ads on TV. I did not pay attention to it till my wife told me she wants one. Yes, advertisements always looks better than a real stuff. So I want search Magicjack online to find what this magic stuff is. 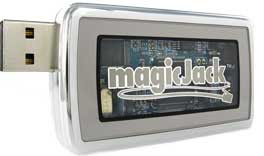 Let me tell you what Magicjack is, it is a small USB device which combines internet telephone service. It is simple to use, just plug in that USB device into your computer, and insert your regular telephone jack to this device. You can call US and Canada any regular phone for free (first year), but you need buy this small device that costs $39.95 plus shipping and handling, to purchase an additional year's service for $19.95. Sounds cheap, is it? 1, Magicjack works fine. It means you can use it to make phone call. Some people say it works fine and some people say not. That is common, because it need install in your computer, and everyone's computer is different, that depends on your computer condition. 2, Magicjack has very bad help service. Its website does not have any information about address, telephone number, fax number. It only has online helpers (live talking) who behind this website. Even I check BBB (Better Business Bureau) rate it only got F which is a very bad service rate. I also found some information about this product, but I still do not know if Magicjack is a reliable product or not. If somebody have experience with this product, would you like tell me your opinion?